Multi-functional tracksuit combining style with ultimate wear comfort. Made from special feel-good material. Features include an elastic waistband with drawcord, two side pockets, covered zippers and elastic bands for leg end width adjustment. Jacket and pants available separately. 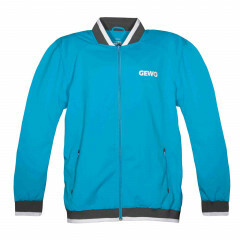 Gewo Tracksuit jacket Mika is beeing added to cart.